Albena Stambolova is the author of three novels. 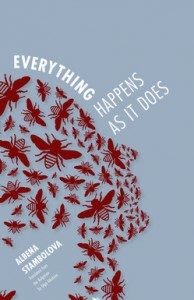 Everything Happens As It Does  (2002) is her debut novel, which has also been translated into Polish and published in the U.S. by Open Letter Books with the support of the Elizabeth Kostova Foundation (2013). It was followed by Hop-Hop the Stars (2003, forthcoming in Polish), and An Adventure, To Pass the Time (2007). She has also published a collection of short stories, Three Dots (1985), and a psychoanalytical study on Marguerite Duras, Sickness in Death (2004). The author of numerous articles and translations, she is now working on a book about fairy tales and a collection of short stories.